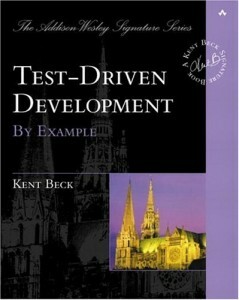 The book is written by Kent Beck and explains the basics about TDD. It does this pretty well, step by step, by example, just like the title says. The book also talks some about TDD in a more general sense. What it is, how it works, why it works, et cetera. I can really recommend this book to anyone who are curious to get familiar with TDD. I certainly see the value of doing TDD and is in the process of trying to incorporate it into my development habits. Red — Write a little test that doesn’t work, and perhaps doesn’t even compile at first. Green — Make the test work quicky, committing whatever sins necessary in the process. Refactor — Eliminate all of the duplication created in merely getting the test to work. Red/green/refactor — the TDD mantra. You can get it at Amazon, and probably a lot of other places too as it is a pretty well-known book.